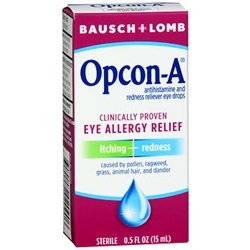 Antihistamine eye drops Opcon-A solution 15mL. Naphazoline HCL and Pheniramine Maleate are active ingredients. 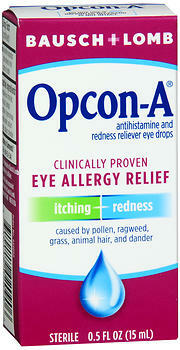 Temporarily relieves itching and redness caused by pollen, ragweed, grass, animal hair and dander. Manufactured by Bausch & Lomb. NDC Number: 10119002090. Comes as singles.